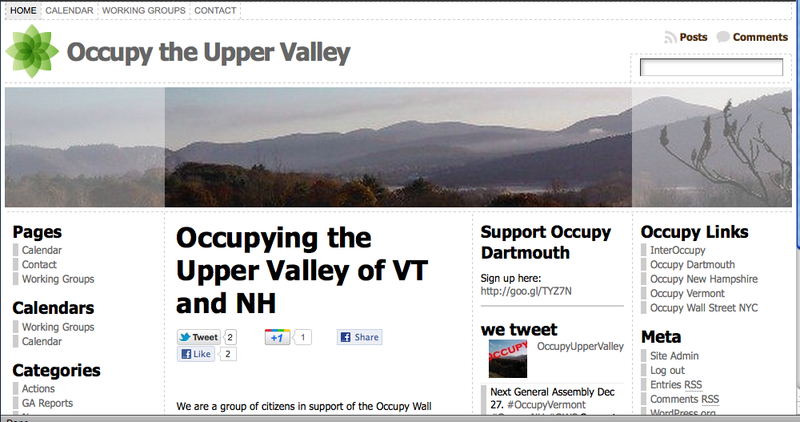 The Occupy the Upper Valley site was proposed as a communications vehicle for the group in addition to discussion and announcement listservs. The group envisioned a site on which meeting minutes could be posted, contact information and a calendar of events would be made available to the general public. At the first communications working group meeting I proposed we use WordPress for the site. I was interested in getting away from the “webmaster” model, especially for this group. I talked up WordPress as a way of allowing contribution from all levels of users, including those who were not computer adept and allowing the site to become truly group owned. The group agreed on WordPress as a platform and in very short order we had a simple communications vehicle using one of my favorite themes – Atahualpa. I used a photo I had taken of the Connecticut River for a header as I had it available and it was the right size. I quickly edited site colors to match. The home page had no content as yet and we requested a statement of purpose or the like to put up there. I ended up doing the logo – sort of trite but there it is. It began by having a red O, in an effort to jazz up the subdued colors I had added some touches of red in the way of the logo and rollovers and so forth. We began with three main pages: Calendar, Contact and Working Groups. I used the MyCalendar plugin for the Calendar. After a month or so it became obvious that a statement of purpose might take a long time to get so we switched the Home page from a static page to latest posts. This gave more of an impression of activity and life to the site. The communications group envisioned one person from each of the working groups being given the Editor role. I dissented, I felt that an untrained user could do a lot of damage and this was borne out when a new Editor, attempting to add an event to the calendar, deleted the calendar entirely by mistake. The other administrator of the site (who left the group shortly after its formation) installed RoleScoper in an attempt to limit editing rights by page. Over time RoleScoper proved more trouble than it was worth and we uninstalled it. As the value of Categories became more apparent to users we moved toward giving any member of the group who wanted it the Author role and steering them toward using Categories to display their posts. I offered coaching to anyone who wished to become an author for the site. One gentleman drove quite a long way to come up to my house for a coaching session and I spoke to him on the phone and emailed back and forth several times trying to help him in posting to the site with a document download included.After much communication and support I was very tickled to receive an email from him with the subject line: I did it! I can’t believe it actually happened, but I got the process schematic onto the piece and the piece published. Tomorrow– the world! Wonderful! This was the sort of thing I had wanted to happen: self-described computer novices posting to the web themselves instead of waiting for the “webmaster” to do it for them. As I write this the site continues to progress, morph and change. After many months acting as the sole administrator, another OtUV member has stepped forward and become active, changing the color scheme and adding new header photos. The site uses a Twitter search list incorporated into a widget to supply fresh content focused on Occupy groups from surrounding states and using the Wordbooker plugin, cross posts content to the Facebook Community Group.